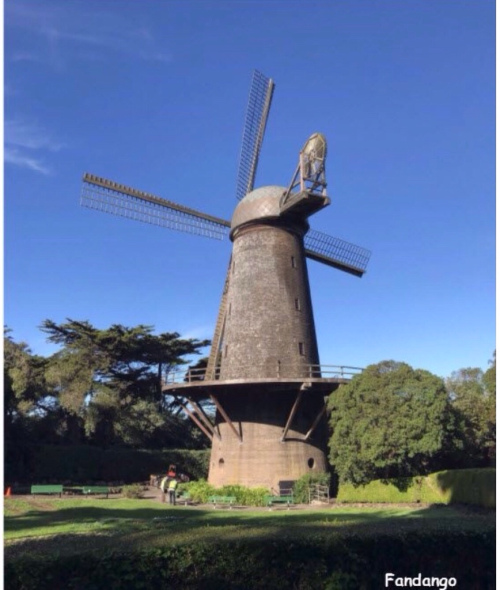 The young couple was standing near the base of the Queen Wilhelmina Windmill at the western edge of Golden Gate Park. It was their third date and after brunch at the Cliff House, they decided to go for a walk. Ana Janssen was introducing David Silverstein to one of the City’s annual festivals. I wrote this for the FFfAW Challenge of the Week of February 27, 2018. The idea is to use the image at the top to inspire authoring a piece of flash fiction between 100 and 175 words. My word count is 174. I cheated. I know where Fandango’s photo was taken. I used to live in San Francisco back when normal people could afford to and I’ve been past the windmills at the western edge of Golden Gate Park countless times. I looked them up and discovered that every April, the Dutch celebration of King’s Day is celebrated there. Sounds like a lot of fun, but is it a story? I was sort of reminded of the Jewish celebration of Purim (which begins at sundown this coming Wednesday but was observed as a community event at San Francisco’s Jewish Community Center last Sunday) so I decided to talk about both of them through a young dating couple, with David being Jewish and Ana being of Dutch descent. Sweet story, a bit more tolerance and acceptance between people of different faiths is always a good thing. Thanks Iain although I didn’t specify Ana’s religious background if any. Also, a secular Jewish person can still celebrate Purim as a cultural event (it’s sort of a mix between Halloween and April Fool’s Day with a fair amount of boozing thrown in) and not be religious at all. That said, it’s possible my friend ProclaimLiberty might bring up the hazards of intermarriage to Jewish continuation which I thought of as I was writing. Of course, my wife is Jewish and I’m Christian (long story), so it’s possible to make it work and still not result in the Jewish spouse becoming disconnected from their community or heritage. Anyone who’s explored Golden Gate Park or hung out on Ocean Beach would recognize that this is one of the two large windmills, so you didn’t cheat. I expected a few to know of them. Good story. Mine is a highly fictionalize version of what happened. I love the cultural details and the respect these two have for each other’s cultures. Thanks. Because of my wife, I am reasonably familiar with Jewish holidays including Purim, but I learned about King’s Day for the first time this morning. Especially in the early stages of dating, young people are absolutely thrilled with each other. I suppose we’d have to follow David and Ana around for a bit to see if that sticks. Sweet story, James! A couple learning about each other’s cultures. Very nice! I enjoyed reading your footnote too. A collaboration between two cultures. Wish we had more and more of those. We probably have it all the time, it just doesn’t make the news. That was a good deal they struck. Will open the doors to learning about new cultures. Learned some thing new here – like always. So did I went I wrote it, yarnspinnerr. Sharing one’s culture… a great beginning! Enjoyed! So wonderful that they are so open and willing to learn about the other’s culture. Well done. I’s never heard of either festival. My wife is Jewish so I’ve been to more than a few Purim celebrations, but the other was totally new to me. It’s great to learn new things.